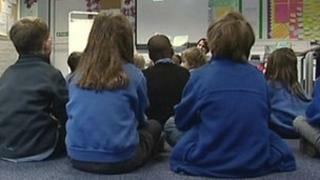 Free schools are being opened in parts of England where there are surpluses of places, a teachers' union says. The National Union of Teachers says this is a waste of public money when some areas face an acute shortage of primary places. NUT deputy general secretary Kevin Courtney said these were "perverse decisions". But the government said most free schools were in areas with the "greatest pressure on places". The NUT, meeting for its annual conference in Liverpool, has published research comparing the location of free schools with the projected availability of places in three years. Free schools are state-funded schools set up by parents or other groups, with the aim of responding to demand from local parents. The union says that about one in five free schools, in the second and third waves of this new type of school, will add to "significant excess capacity". It says that in Suffolk with three secondary free schools, there will be a 28% surplus in secondary school places. At the same time there will be a 2% shortfall in primary places. In Bedford, the NUT says a secondary free school is being funded when there will be a 25% surplus at secondary age and 38% shortfall in primary places. The union criticises the Education Secretary Michael Gove for spending on free schools rather than the pressing need for primary places. "Gove is engaged in an ideological exercise, without sufficient care for the consequences of that policy," said Mr Courtney. He said it was an "astonishing" decision to open free schools at a time of austerity, a shortage of primary places and the cancellation of school building plans. Mr Courtney said free schools were being opened when primary schools were having to add on temporary classrooms. The union says that opening new schools in areas with a surplus of places will damage existing schools by drawing away pupils and threatening the viability of services. Last month, figures from the National Audit Office showed the need for more than 250,000 extra primary school places next year, to meet the demand of a rising birth rate. This demographic bulge, which has seen schools struggling to tackle the shortage, will move through to secondary level. A Department for Education spokesman rejected the claim of failing to respond to local need. "The majority of open mainstream free schools are in areas with the greatest pressure on places," he said. "More than two-thirds of those planning to open from 2013 and beyond will also be in areas of basic need." "We have always been clear that we want free schools to open where there is a demand from the local community - whether that is down to basic need or because existing schools do not offer what parents want." The education department says that 80,000 extra primary places have been created and is confident that the extra demand can be met. Natalie Evans of the New Schools Network, which supports groups wanting to set up schools, said: "Let's not forget that the reason some schools have surplus places is because parents are not happy with what's on offer. "Free Schools being established in these areas are allowing parents the choice of a good local school, which in turn creates competition and drives up standards. "Free Schools cannot open without significant parental support, giving parents the chance to have their views heard instead of being drowned out by local bureaucrats and those who want to defend a status quo that is not good enough."